Himeji Castle - With a long and turbulent feudal period, Japan is home to many castles. Of those which still exist to this day, three stand out above all others; and of those three, the Himeji Castle would have to be considered the apex of Japanese castle architecture (the other two being the Matsumoto and Kumamoto Castles; although the Kumamoto is a reconstruction of the original). 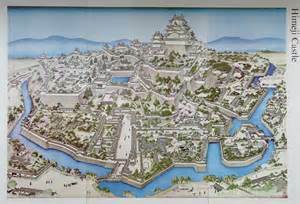 The first incarnation of Himeji Castle was a simple fort built in 1333 by a warlord named Akamatsu Norimura. He ruled the Hamira Province in the southwestern end of Honshū (the big island). The fort was strategically located on Himeyama Hill which overlooked the coast. From there the ruler could view the surrounding region and spot the advance of an enemy. In 1346, his son, Sadonori, converted it into a true castle, strengthening its defenses and making it more livable. By 1580, the castle came into the possession of Toyotomi Hideyoshi, a powerful daimyo (and successor to the famed Oda Nobunaga). A year after occupying it, he fortified the castle and added a keep. Two decades later, he passed it on to his son-in-law, Ikeda Terumasa. Between 1601 and 1609, Ikeda completely rebuilt the castle into what it resembles today (although it has been expanded several times since then). It is considered one of the most visually impressive and least penetrable castles in the world.